You Think You Are Better Than Me? 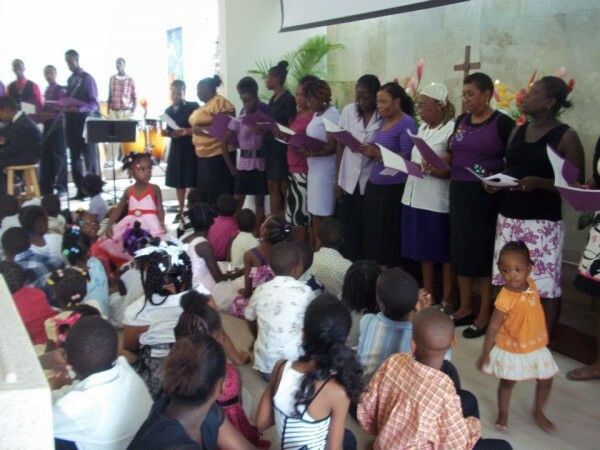 Are All Grenadian Churches Arminian? Those of you who are close to Grace’s ministry know that as of the end of 2013 Ellen and I resigned our calls to as Pastor and teacher, or as we have been called, we are no longer Pastor and Mrs. Grace Lutheran. As we freeze here in Wisconsin and wait for the next chapter of our lives we have some very bitter sweet memories of our time in Grenada. Just yesterday and a song on the radio got my eyes leaking. I doubt if anyone on the snow covered highway that day was playing Romain Virgo or Chronix. These songs immediately bring some very special people to mind. People have asked me about the blog and what will happen to it now that I am gone, because it is what kept them up with what was going on at Grace. I have no answer for that now. But it made me think about what I wanted to say in the final blog. Final words, like Jesus’ words in the upper room in the gospel of John, are powerful. So I wanted to choose carefully what was most on my heart. I also wanted to say some things to the youth with whom I spent so much time mentoring and put it in a place they could read in the future. The month has been like someone sticking a very painful knife into our hearts. This is exactly what the Devils wants, for us to have wounded and bleeding hearts. It is his way to divide and destroy. Do not let him win. Focus on what is next and how you can grow. Celebrate the good things God has done for us and through us and the precious time we had together and the things we learned from each other. What did we learn? That Jesus heals hearts, that you are loved, and that what you do and say matters a lot in God’s world and family. YOU ARE LOVED. YOU MATTER. The Devil does not want you to believe this. He is whispering always in our ears that we are worthless and that we are just here to survive. It’s all meaningless so get whatever you can for yourself. That is why Solomon in the verse above says, “Guard your heart, because everything comes from there.” God made your heart clean and good. Guard it! When we decide to lie (even just a little lie), or to steal something (even borrowing it for a while), or when we say something that ruins some else’s reputation, or we assume the worst about someone, or take advantage of a situation for our own selfish interests, or when we give in to sexual temptation, we make an agreement with the devil. “Devil, your way is the best in this situation and I am walking in it.” Agreements with the devil are dangerous, even if we don’t realize it is happening, because then he gets a foothold in our heart. Like an invasion of your heart he lands and does not give it up easily. He builds a stronghold and waits until he can capture some more land in our heart at a later date. Before you know the devil is dug in and has a big claim on something God has washed clean in his blood. You must fight this! Guard your hearts. Stay focused on God’s way, the only safe way, and His word as a desperately needed weapon to defend yourself. Do not let the Devil divide you. You have developed wonderful friendships, especially the youth, and all this is centered on God’s love for you. He showed you how and gave you this gift. The Devil cannot harm you if you stick together, share burdens, support each other, and hold each other accountable. Do not settle for a church family that only says hi once a week, but keep the closeness we shared, pray for each other. Guard each other’s backs. Or as Jesus says in his final words, “Love one another. People will know you are mine if you love one another.” The Devil knows how powerful and dangerous this is to him and he does whatever he can to separate us, close up our hearts, and keep us from trusting each other. Don’t let him have His way. On our last Sunday we sang, “Lord, I Give You My Life”. My wish has always been that those are more than just words which you sing so well. Jesus gave His life so you can say that and actually do it fueled by the Spirit. Not only is this a good idea, but if you do not do it, you put yourself at risk to Satan’s nasty attacks and they will come as you have seen. Because I know this is important I am not going to leave you and forget you. I will stay in touch with your lives, continue to care about what is going on, pray for you, encourage to follow your new shepherd, and everything else a good father would do for you. I love you and as long as I live, I will never forget you. Thank you for sharing that love, it is precious to me. Goodbye for now and a big welcome to Pastor Jason and Judy who are serving as the vacancy pastor and first lady. God bless you all! 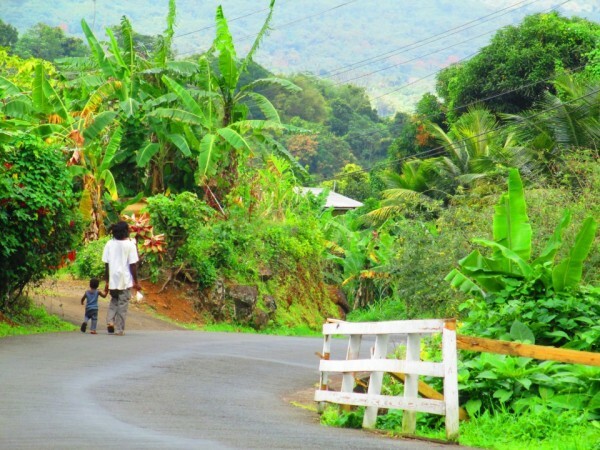 Some cultures love a good debate and, in my limited view, Grenadian culture is one of them. The problem is when well motived debates slip into venomous emotions and disrespect. If you interact with the world around you sooner or later you will experience these things, probably sooner. In Grenada on a spiritual level it usually involves a heated discussion on what my church teaches and what you should or shouldn’t do. 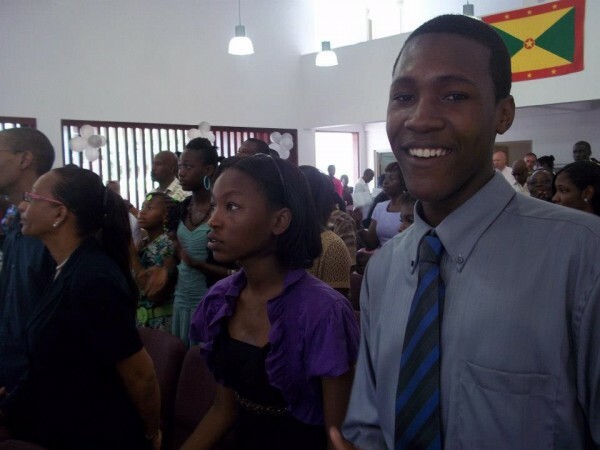 Since the Adventists are so big in Grenada I often find myself answering questions about why we worship on Sunday or why we eat pork. With Jehovah’s Witness it is usually a question about the trinity along with accusations that we worship three Gods not one. Last week I got a question about our choice of Bible translation. You know, “If the King James was good enough for Jesus, it should be good enough for us.” (Sometimes you can’t convince people that the KLV was written 1,600 years after Jesus was born.) Along with this often is the idea that the NIV translation is missing verses of the Bible! Well, truth is they are not missing, they have been relegated to footnotes with good reason. (See link for more information… http://www.missingverses.com/. Questions like these and a hundred others are healthy. They make us search for truth. Unfortunately too many, including us sometimes, aren’t interested in truth, but in winning a disagreement, even at the cost of destroying unity and love. It is hard sometimes to know when to continue “giving an answer” or when to “shake the dust off” and walk away. It is one of those things I have always found challenging in the ministry. Sometimes people read here and they think, “Wow, lots of good things going on there. And it is true, God has really blessed us. But getting where we are, with an active ministry that makes so many connections with such a variety of people each week, has been a monumental task, a miracle in a lot of ways. So, let me tell you why we are so thankful. 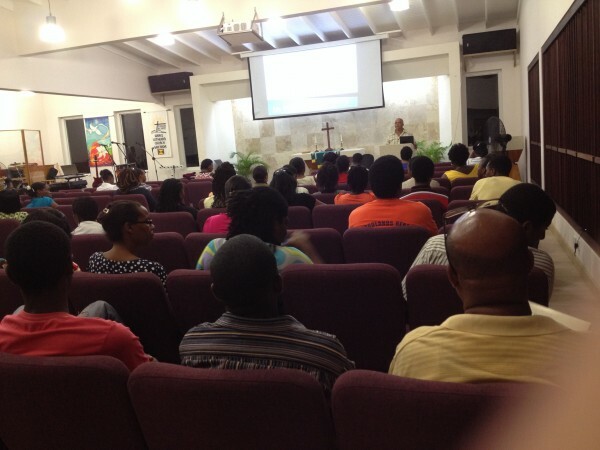 October marked the first ever Caribbean Pastor/Teacher conference in Antigua. Four of our teachers and our office manager Tamara and myself attended. The above picture is with board member Pastor Ron and Lois. The travel itself was a bonding experience for teachers, some of whom were not used to traveling. The training we received was insightful and encouraging. Since it was our first time we quickly figured out some things we would like to do better, but the Antiguans were wonderful hosts and our people are eager to meet again soon. We are so proud of Adonna Moore, Felisha McPhoy, Alex Medford, Ellen Soukup, and Tamara Stuart Barry for working hard to improve. 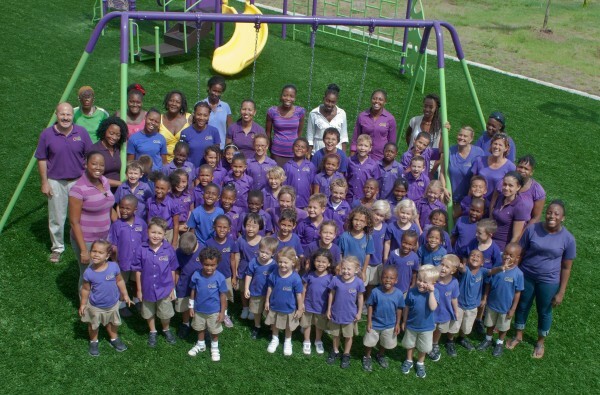 Grace Lutheran School is in full swing in its second year with now over 60 students. There have been again bumps in the road over the past month, but the response has been overwhelmingly positive and our staff is molding together into something very special. I want to especially note newcomer teacher apprentice Aurea Stroude. She has added a big smile and a ton of energy to the kindergarten classroom. I would also like to note praise for our new kitchen staff. Church members Denise Philip and Crystal Ross have not only been outstanding chefs, but good business persons, and excellent at communicating with parents and children. We are so thankful for them. They are adding a whole new dimension to our school. Let me also note church members Alice Braithwaite and Belinda Griffith who come almost daily to clean our huge facility. People who work behind the scenes don’t always get the credit they deserve, but we appreciate these ladies. The school is not the only thing that is new and improved. 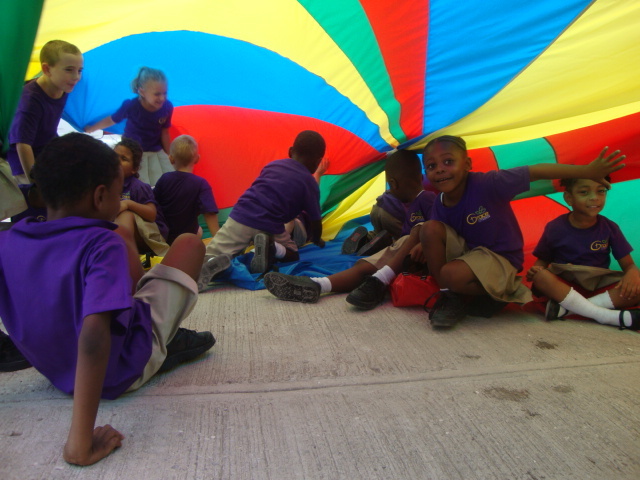 The After School Program (GRASP) has added gymnastics to our slate of activities. It immediately became popular with students and parents. 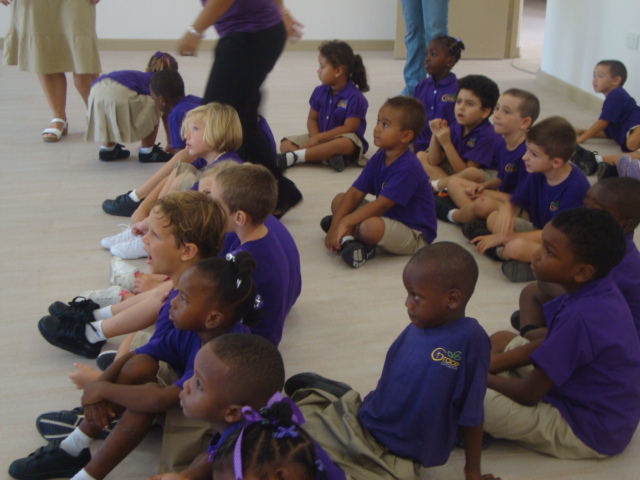 Other GRASP programs, Marshal Arts, football (soccer), swimming, and music all experienced growth as well. 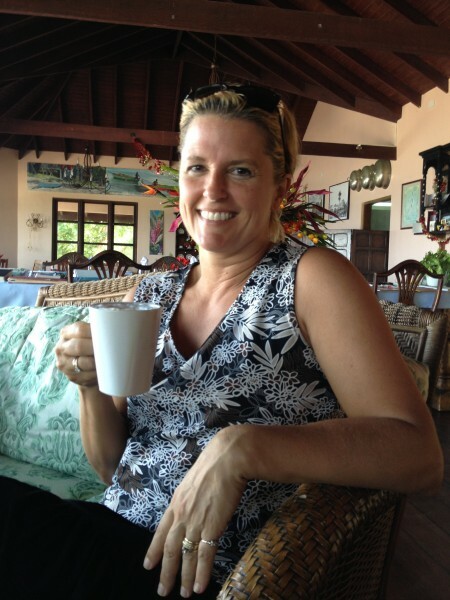 Adonna Moore has taken over administration of this multi-faceted program. There is strong evidence that our church is beginning to benefit from all these connections we are making through these programs and ministries. We have had a number of return visitors not only from our programs but from our Woodlands neighbourhood. A highlight this month was our joint school and church beach picnic. Church was packed with school parents and we had a great turnout at the beach and a mingling of our people like we haven’t had since we opened our new facility. It was such a huge success that by popular demand we will do it again early in 2014. Finally, we finished this month by hosting an island wide Worship Musicians conference/workshop. I had the honour of being one of the main presenters and our amazing facility served as host to over 150 Grenadian musicians. Our own musicians learned so much, especially from sound engineer Hervin Hood of Rubato Studios who was also one of the presenters. We thank also Seba band for organizing the conference. Grace Lutheran had nine musicians representing us. On a less significant level my secretary Neisha and I moved from the super busy main office to the Clinic/Wellness Centre area. Since the area is not yet used for a clinic, we decided to put part of it to use as an office. It created another work space for us and set up a much more appropriate church office area with a little more privacy. We are so thankful for the facility that has been provided for us. What an amazing blessing, it is making our work that much better. Please pray for us because all the talent, facility, and planning is for naught without the Holy Spirit in it. Please pray also for our sister Donessa freezing at WLC in her first year of study in the USA. She is the one below with the star on her cheek, hah! 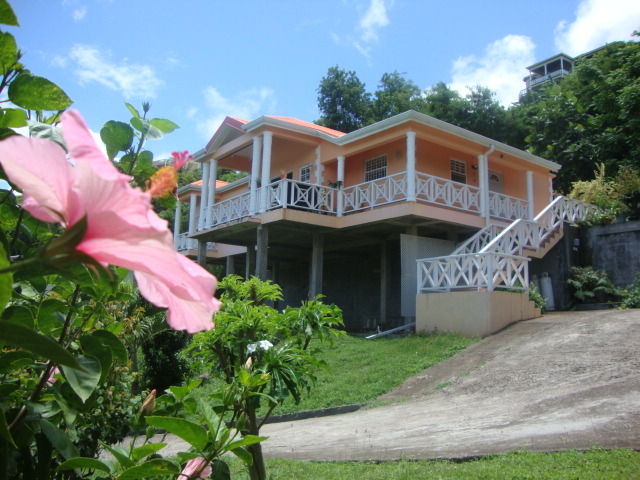 September means that we have just returned from Holiday in the US and we are now into our sixth year of service to God in Grenada. Sometimes it seems like the time is moving faster than a Grenadian bus driver trying to pass a competitor. This is usually a good time for me to stop and think about where we have come from and where God is taking us. To be honest I didn’t do to much of that last year as it was such an overfull year. We finished a new facility complex, we started a new primary school, and we launched a highly successful after school program (GRASP), and increased staff from 2 to over 20. God is amazing, but it was a very stressful, exhausting year. Some of us floundered emotionally and the transition was not easy for many Grace church members. This year we absolutely must get back to setting a priority on relationships and developing people, not programs. I will do my best to lead us back into family fellowship and Bible study focus both on our staff and membership. After all, as Jesus prays for us in the passage above, our unity is the thing that enables us to give the most glory to God. When there is love in God’s family, the world has a living testimony of God’s love for us. Pray for that for us. Just before I left on holiday there were two major events hanging. Ellen’s impending back surgery went very well and it is so good to have my partner back and enjoying life pain free. The second was the church event of the year, Patrick and Neisha’s wedding. Patrick Roach is our worship leader and Neisha was hired as our church secretary. These two are shining example of the bright future of our ministry. They are talented and loved as you can see. 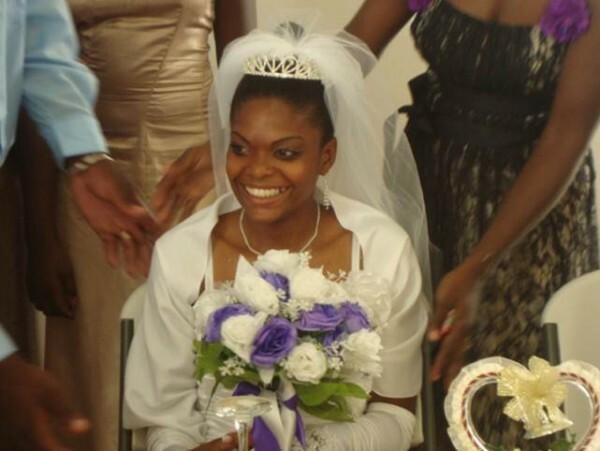 Their wedding was a celebration of Grace family. I would especially like to thank Kelvin & Fiona La Touche for their excellent and generous wedding planning services, also Joanne Davidson and Le Conch Spa. They made this event very special and so beautiful. Neisha finished her Bible Basics so she could celebrate the Lord’s Supper with her husband for the first time. Patrick had several very beautiful love songs prepared for her at the reception. August was both a month of pleasant surprises and shocking grief. 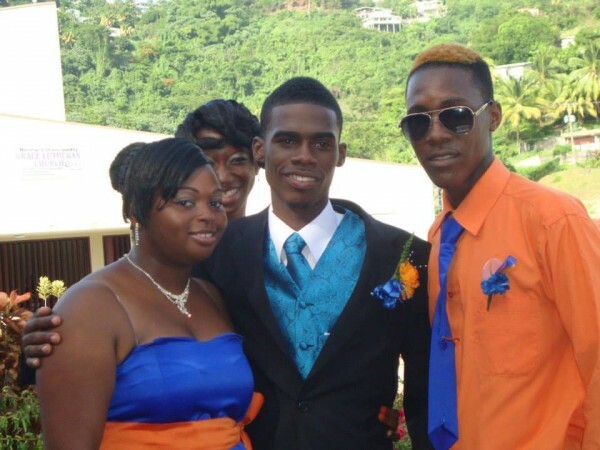 Bad news first, Kester Francis was called home to heaven. Kester had been a leader in our church band for years. He spoke fondly of former Pastor Radloff and how he led him to Jesus and helped him fight addiction. 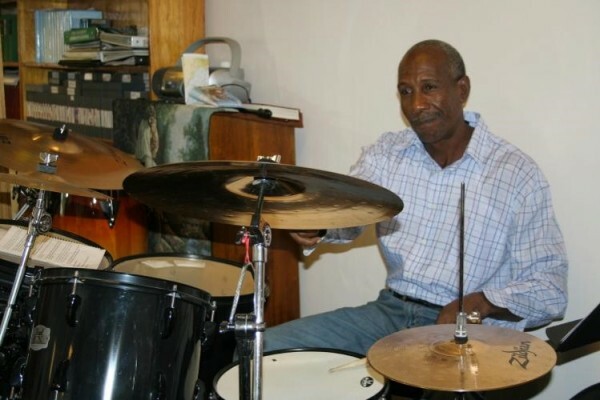 Kester was a “skins master”, one of the finest drummers in Grenada and he was a mentor to our young musicians. He died at 56 in the US of brain cancer. He will be missed, but heaven has another great drummer. The good news came from our young students preparing for ministry at Grace. Donessa Belgrave won a substantial scholarship at Wisconsin Lutheran College in the US to study to be one of our teachers. Donessa has been active in our youth, drama, and Sunday School ministries for years. She has proven herself loyal, dedicated, and talented. We are so excited for her. Pray for her as she adjusts to a new culture and is challenged academically. Donessa’s scholarship contract states that she must come back to serve at Grace for at least five years. She was not the only student to shine. Shemron Ross was granted a full TMCC scholarship after an impressive 9 CXCs and honours in both math and business. 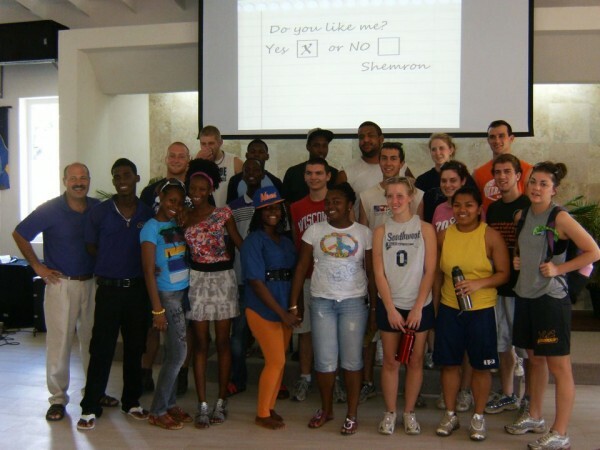 God willing Shemron would one day play a significant role in the business aspect of God’s work. We often get people who call saying, “I hear you guys are giving out scholarships, how can I get one?” First, come to church and get to know us and our Lord better (9:30 am Sundays). Second, get involved with our work, serve others. Third, show that you are a good investment, prove you can develop the talents God has given you, work hard in school. Do these things over time and we will do our best to help you get an opportunity to serve God at a higher level. As I write the first day of our second school year is wrapping up. Our enrollment has increased to 58 students up almost 20 from last year. 13 of them are receiving full or partial scholarships from our generous loving donors. So much work has gone into preparing for this second year that it doesn’t seem fair to just state it in one sentence. We have added a third grade and several new teachers. Welcome to Alex Medford, Rina Horsford, and new school secretary Shemida Moses. God has blessed us with an impressive facility, but what really makes Grace Ministry special is our talented, friendly, and dedicated staff. We committed to hiring people who are trained, but also who showed the right heart for serving God. I think our people are growing one of best school and ministries on the island, but talk is cheap, come and see for yourself. Finally, since this is sometimes a personal blog, let me praise God a bit for our new grandson, Benjamin. Jake and Rachel have been truly blessed. Ben was putting on his best behavior while we were there so we think, of course, that he is a perfectly behaved, genius child. Rachel must have pinched both her boys before the picture below. Have an amazing month! This time of year most Pastors are writing Mother’s Day and Father’s Day sermons. 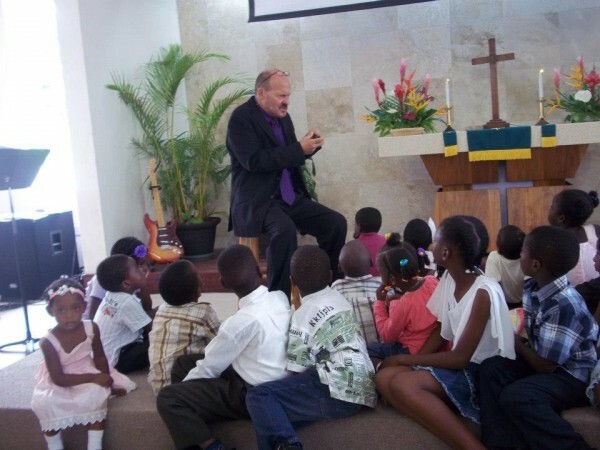 I did this for years in the US and every time I do it in Grenada it occurs to me how dramatically different sermon applications are here. It is of course so important that we relate God’s Word to everyday life. Growing up in a different part of the world makes this a challenge sometimes for me. Although over time I am becoming more and more Grenadian in my life view. For instance, following is list I used in a sermon in Seattle of things that make parenting challenging. In each case I explain why this would or wouldn’t work here. We find at Grace God is often leading us down “unfamiliar paths” and that things are constantly changing. As we come to the summer of our first full year of school and our first year in our new facility. The word that most characterizes the year would be change, dramatic change. It has not always been easy to adapt, but when we look back we have to say, “Wow, what a blessed year” in spite of the challenges. The last month was no different. My wife Ellen was forced to return to the US for medical reasons. Doctors found cysts on her backbone that were the cause pain and numbness in her legs. Surgery went well and she is recovering nicely. Thank you to her sister’s family for watching over her during recovery. I miss her dearly and so did all the areas of ministry that she serves, her 4K school classroom, music students, and Sunday School program. As I write this I will see her again in just over a week. Absence does indeed stir fondness and appreciation. Thankfully we are keeping busy in her absence. 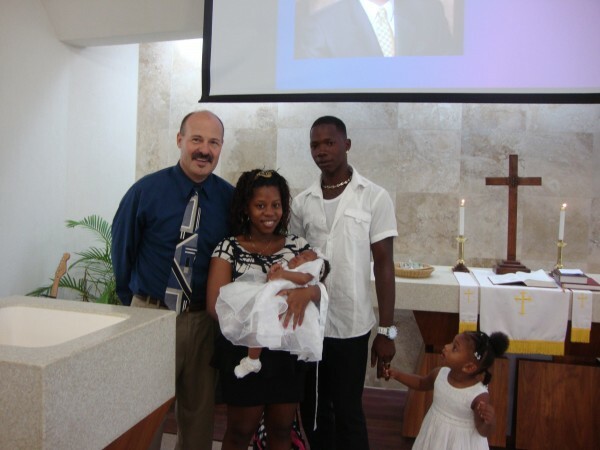 Asia George, daughter of Hesta George was baptized. 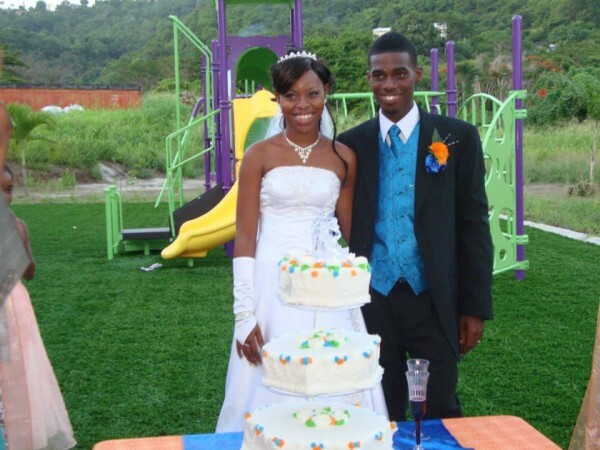 Blendon and Rachel Alleyne were united in marriage in an outdoor ceremony. We have two Bible Basics classes going right now each week with half a dozen students who are seeking membership, several of them are parents who have students in our school. It is very nice to see our parents seeing the value of spiritual growth in their kids and to see that the school is serving as an outreach tool as well as nurturing our children. The school year is finishing strong. We learned so much in our first year and continue to adapt for the better of our students. We hired a new teacher, Alex Medford, who stepped in take Ellen’s place in her absence. And in the new year in September will be the lead teacher in our Kindergarten classroom. Alex has already fit in very nicely with our staff. She not only has a bachelor’s degree, she has experience in school classrooms, but most importantly she has the “Grace attitude”, positive, selfless, friendly, creative, self-disciplined, hardworking, and having fun. Welcome to the team Alex! As the school year winds down we are busy doing student assessments and meeting with parents. Communication with parents is something that we really take as a priority. We also held another teacher training workshop in classroom management. Our teachers have grown so much over the year. This is why without except we resigned all of our teachers for next year. Some of them will be moving around as we are adding a classroom up to third grade. Our number of students enrolled for next year is up to 50 and changes almost daily. There are lots of parents who are coming in for a tour this time of year. 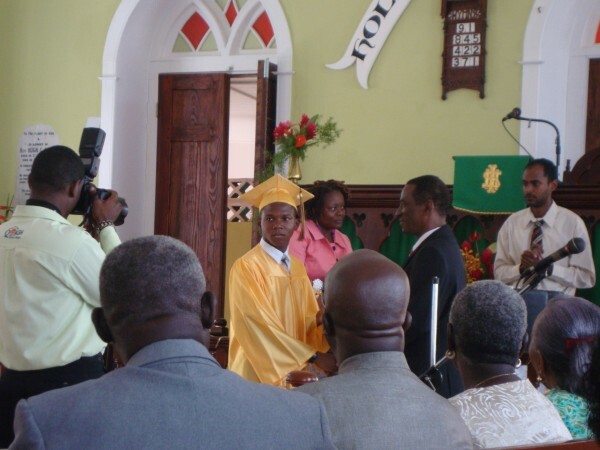 We were able with the help of many generous donors to offer scholarships to 8 Grenadian students who would not have been able to afford our quality education. Again we are so thankful for God’s blessings through our school. But the most significant thing of all is to see our Grace kids and how they have grown in so many ways over the last year. We really are a learning family. Ours is not the only school wrapping up. We are so proud of our Grace people who graduated with honours at a number of island Secondary Schools. We celebrate with Dylon John from Westerhall Secondary, Desmond Plenty and Marvin Christopher from Wesley College, and Shemron Ross from Happy Hill Secondary. It is always an honour when one or more of these young people pin you as a guardian on their graduation day. It is a very moving thing for me. I am so proud of these young men and what they are making of their lives. As a ministry we are constantly accountable to our generous donors and to those we serve. Right now again we have several visitors for our US Grace board on the island, evaluating our ministry, offering valuable feedback, and helping to organize plans for next year and beyond as far as staff and budget. We are so thankful for people like Pastor Dave Kehl and Principal Shaun Luehring who give of their time and wisdom to so graciously help us thrive in God’s grace. Your heart and excellence help us set the tone for adapting to all the blessings we enjoy. Thanks. Over the past year Grace Lutheran has gone from 2 employees to over 20. I would be lying to you if I told you this has been easy. We wanted to create a place where God’s people could use and develop gifts to serve. We had a certain attitude of humble cooperation and higher level of excellence and growth in mind. For the most part we have found people that got what we were trying to do or in the process of growing into it. We are especially thankful for our teachers who as we now are into the last trimester are doing exceptional work. We are also getting more and more volunteers in to help in classrooms and after school programs. 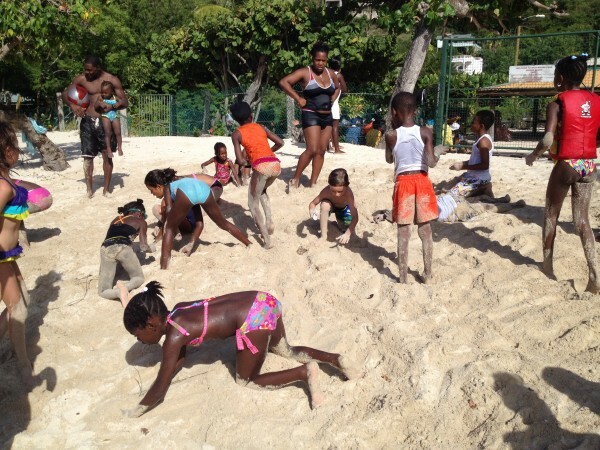 Our after school programs are hard to find in Grenada. We offer music and arts classes including Martial Arts, Soccer, Dance, Swimming, Book Club, and tutoring. Word is getting out and parents want their kids involved. We are making great connections for our church. Of special note is the baptism of Aveya & Cadyn Davidson this month. We connected with their family through our school and they have been faithful in worship. Skilled instructors are also finding a place to use their gifts to serve the Lord. We are committed to developing talent and opportunities for those willing to work hard. Grace isn’t just about having fun or having a job, but about growing and using our gifts as God gives them. People want to belong to something they can be a part of and be proud of something that is really making a difference. These are some reasons why our ministry and support continue to grow in spite of challenges that we face. So, what happened at Grace this month? We hosted the annual Caribbean Conference for the first time. 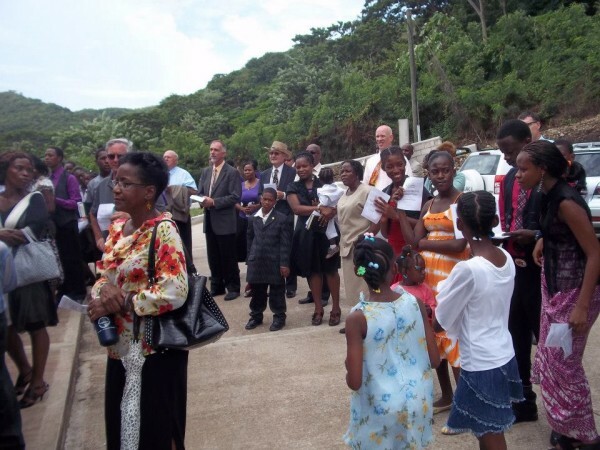 Pastors and families from Antigua, and St. Lucia came to Grenada for several days of fellowship and meetings. We made plans for future meetings to focus more on training local staff, especially in our schools and we changed the date to later in the year rather than after Easter. It was a month of congregational meetings, growing pains, and leadership reevaluation. There was some positive listening, some changes, and some discipline. God willing we will have a time of healing as we learn to move forward together. God encourages us to rejoice, even in hardship, because it produces strength and character. So, we are doing our best to rejoice. 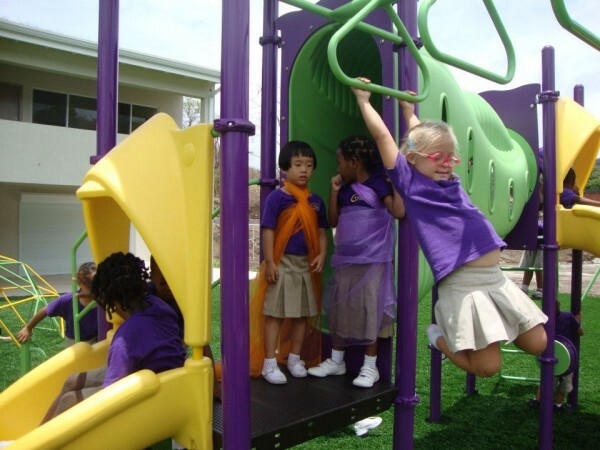 It was a month that saw finally the completion of our facility with the installation of an amazing playground. The children are just giddy about playing on it and on several evenings already I have had the opportunity to visit with Grenadian neighbors who came to the playground just to let their children play. 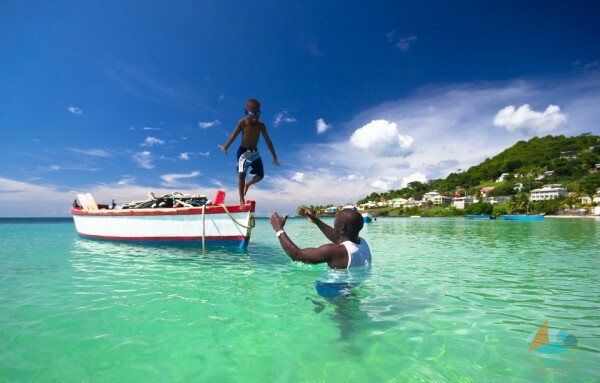 We can safely say, there is nothing like it in Grenada. We are so thankful to those who made it possible and know it will be a draw for many of our ministries long into the future. 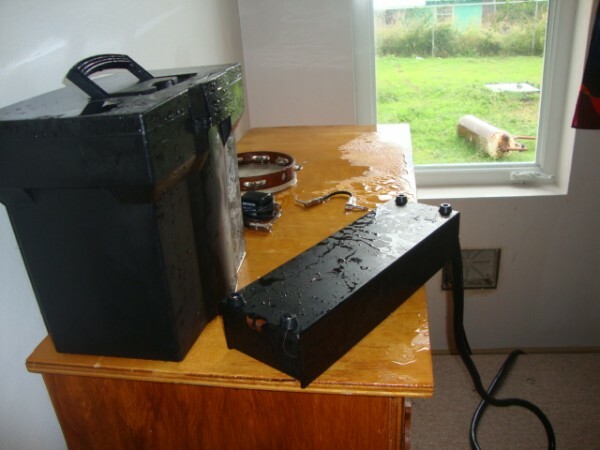 The dry season ended with a week of hard rains and our church drain system overflowed into our church drowning our electrical equipment. Thank goodness for tile floors and cement block walls. There was a little damage but when you consider that the whole church was covered in about three inches of water, we got if pretty easily. Finally, we elected a new trustee which is the highest position of leadership in our congregation. This is a big deal because we do not have that many male leaders in our congregation and it is important to us to not just fill leadership roles with warm bodies, but that leaders truly be of highest qualifications. Our newest Trustee is Andre Worme. Andre has been a great blessing from his very first. He is not only highly successful and respected in the work place, but has shown a hunger for God’s Word and spiritual maturity that we would love our young men to model. I believe that Andre’s assuming of the mantle of leadership is a significant step in the development of our congregation. Andre's the one with the hand out in the picture below. Also of possible great significance was the visit of Ryan & Jenni Hellpap from the US. Ryan is a business person who works in human resource. He and his wife are looking for a place to serve over seas for a year or two and they may be a possible answer to prayer in helping us develop our programs and the people to run them. One final note… we are looking for people to help us decorate walls of our new facility. Sometimes people ask, “How can we help your mission?” Some wonderful person donated the below banner to our church in St Lucia along with several others. The padded texture of the banner makes it ideal for our concrete walled buildings down here because they absorb echoes as well as make thing look so much more worshipful. If you know someone who may be interested in making us a few of these we would be so thankful. God bless your month! Recently I was reminded of an old black and white movie I saw long ago about a cruise ship that went down at sea. In one area of the disaster there was a wooden lifeboat and too many survivors swimming to actually be saved in it. So, it was left to the shipwrecked to decide among themselves who would be saved and who wouldn’t. At first the strong tried to force their way, but they were overruled and left out. A female doctor and a professor were put one the boat, as was a young mom and her toddler, and a teenager among others. There was a rich man who was at first rejected, but then offered a huge financial reward if they survived so he was put in the boat. A lawyer and a convict were voted right out of the boat along with a garbage man. It occurred to me that life is a lot like a lifeboat and we are constantly sizing each other up to see which of us are worthy and which are not in our minds. In fact, I would go so far as to say that we are obsessed with what others think about us. We live to be admired, appreciated, respected and we will do all kinds of crazy stuff to get there. Some people think that a degree or good looks get them in the boat, others think wealth and power, others think it’s getting all our doctrine right or faithfulness in church, others think it’s skin colour, and others think it is a certain nationality or political party, some others even think it is how popular you are or your gender. The truth is we are always sizing each other up on the basis of things like this and thinking that we are somehow better than someone else for whatever silly reason. Kind of makes me wonder why we are this way and really, I think, what it comes down to is that we are all very insecure about who we are and where we belong and we are crying out for someone to say, “Hey, you ought to be in the lifeboat.” No one does that like Jesus. The best thing about Jesus family is that it is not, in His mind, a lifeboat with a limited number of seats that only certain kinds of people are entitled to. In His mind, you are not better if you are a man, or rich, or beautiful, or white, or got a degree, or are the boss, or voted NNP. In Jesus mind we are all kind of broken but we are so precious to Him that He sacrificed His own life for us. Obviously God loves diversity because no two of us are the same. It’s the way he made us. The whole idea of me better than you is completely human, not from God. In Jesus we are each of us completely secure. We don’t need to fight for recognition or justify our value. Among many other reasons, that is why this guy, will always follow Jesus. In Grenada, like everywhere else, people tend to put too much emphasis on who you are and what you look like. We are insecure, just like they are in powerful countries like the US or China. That is why Jesus love and blessing to us are, one so surprising to us, and two treasured by us. That is why we find the energy to make it through the challenges. So, what is going on in Grenada? Well, we have a new (old) government as the NNP party won the election by a total landslide. They won every seat in the parliament! In fact a few of us are concerned that there will be no opposition representation to provide a check and balance. The NNP victory does should how badly things are here economically and how dissatisfied the people were. The NNP were particularly savy at getting the youth out to vote. As I said last month, Grace Lutheran has always had a good relationship with the NNP and any Grenada government. Romans 13 says all governments are established by God and accountable to Him. We are praying for our new Prime Minister, Dr. Mitchell and his government. They have a big, big job. This was the month of the wedding. Alicia Alexander and Kirbie Lewis were united in marriage by me at Grace on February 16th. Patrich Roach and Nisha Thomas set their wedding date for July 13th. 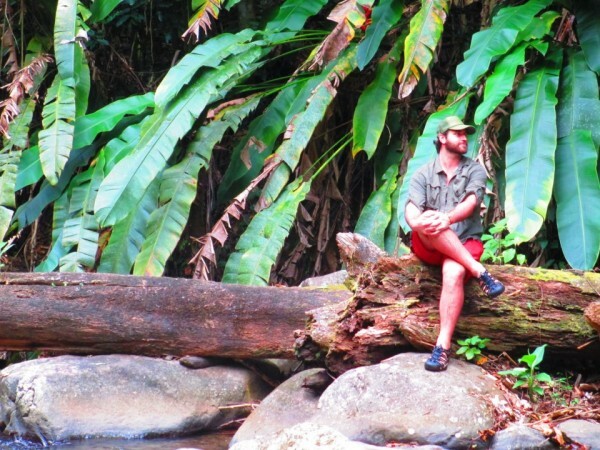 Newlyweds Nathan & Meta Rosenburg enjoyed a working honeymoon in Grenada. Nathan is a nurse who is part of a team exploring and putting together a plan to open a medical clinic on our campus. Nathan was amazing at visiting clinics and interviewing Grenadians in the medical field to get a feel for how we can best fill a nitch. Nathan took several of the pictures in this blog. The continued expansion of our school is another big story. We have averaged nearly a new student a week since January growing from 30 to over 40 students. 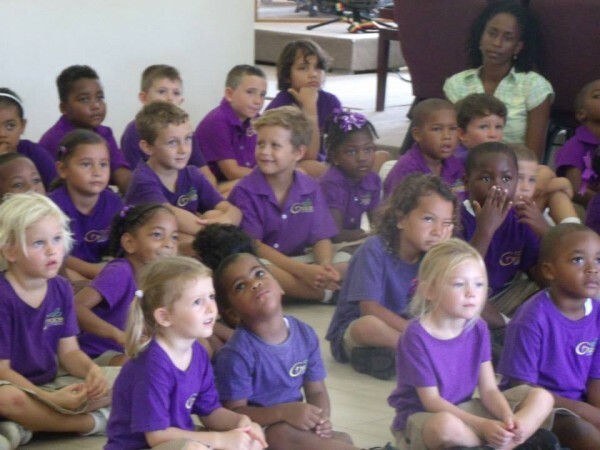 Ellen’s 4 year old class is now up to 17 students! Even as I write another new prospective parent is touring the building. This growth 2/3rds into the year was completely unexpected and while exciting, is proving to be a huge challenge for principal and teachers as classroom processes shaped over half a year completely need to be reintroduced. We are more than ever in love with our staff as they meet these challenges and grow. Day after day I watch our staff and marvel at their love for our students and their cleverness in teaching them. Pray for them as they are putting in all kinds of overtime adjusting. It will be so nice when we are not doing everything for the first time. Finally, this month marked again the annual Secondary School volleyball tournament which we started with the help of WLC so many years ago. 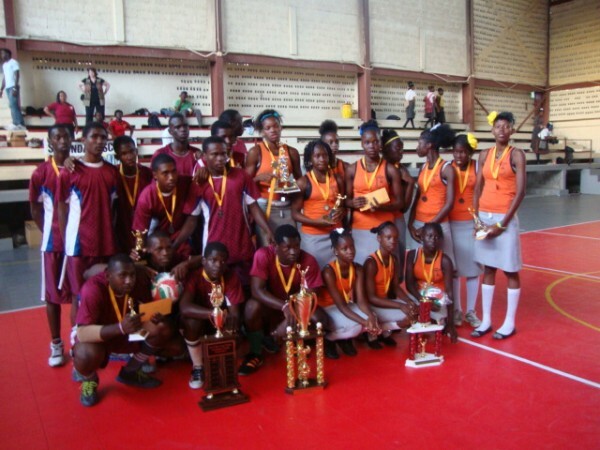 It is amazing how this program continues to develop and volleyball catches on in Grenada. Now we are enter teams in international beach volleyball competitions and placing! This year’s winners were MacDonald College and the Grenville Girls Secondary School. Thanks to Jerry & Kay Fischer for their continued support of this effort and the good will it wins us. While we admire and praise God for the hard work and skill of the victors the best news is that in Jesus eyes every one of those competing is precious and loved. God bless you all until next time. 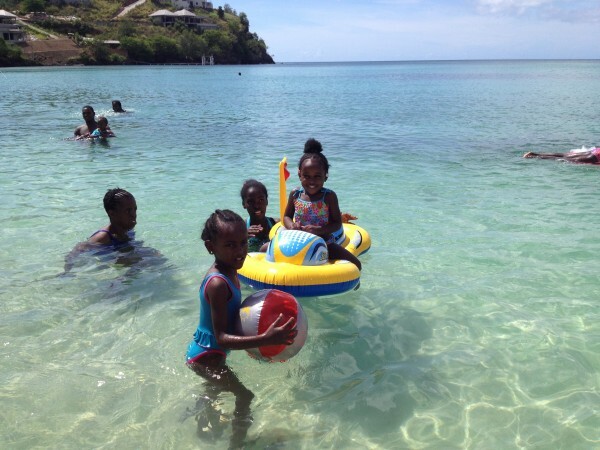 Each month I try not only to give you an update on Grace Ministry, but also to give you a bit of a flavor on what it is like to live in Grenada. This month the entire island is churning with election campaigning. Grenadians are very serious about their politics and you can often find them in heated debate. This election will be interesting. Like the US there are two current strong parties, the New National Party (NNP) and the New Democratic Party (NDC). The NDC is currently ruling after upsetting the NNP in a landslide victory four years ago. However, it has not been an easy four years for Grenada and just about every sector is struggling. The NDC has gained a reputation as a do nothing party that is disunited, while the NNP got voted out in a landslide on a reputation of making shady deals and racking up huge debt. Reputations of course in politics are almost always exaggerated. So this is leaving many Grenadians agonizing as to where to place their votes. It seems likely that the NNP will get back in as they are making the case that they have learned their lessons and will now be better rulers. Grenadian politics models the UK system where each district elects a representative that then is sent to parliament. The majority party in parliament picks the Prime Minister and his cabinet. There are a few things I find that people in the US need to learn from Grenadian politics. This election runs for only 5 weeks. How refreshing compared to the agonizingly long US process. 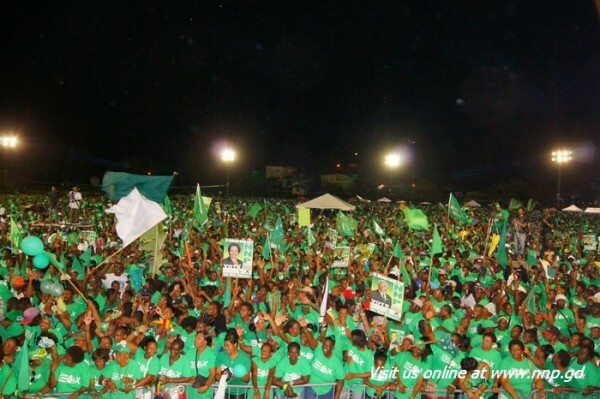 Grenadian elections are centered around huge rallies. This election has had refreshingly little mudslinging. At the same time, like politicians everywhere, Grenadians make all kinds of promises and give very little specific information as to how they will accomplish these things. The NDC is trying to weather a no confidence vote in the parliament. The rising cost of things and the abysmal unemployment situation is a likely formula for change. 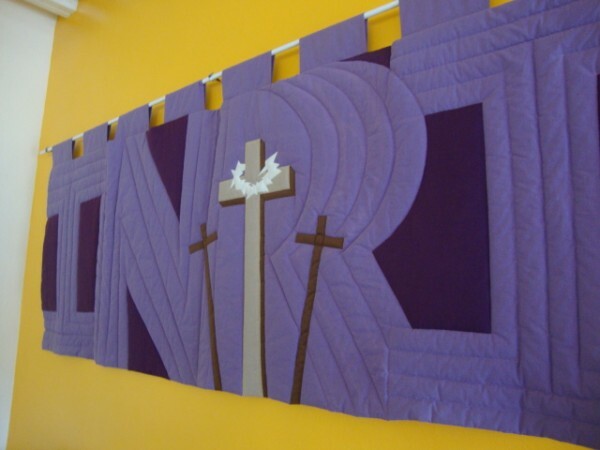 Both NNP and NDC governments have been good to Grace Lutheran in different ways. The NNP was very helpful with taking our youth volleyball programs to the whole island’s secondary school system and then of course through the Ivan recovery period. 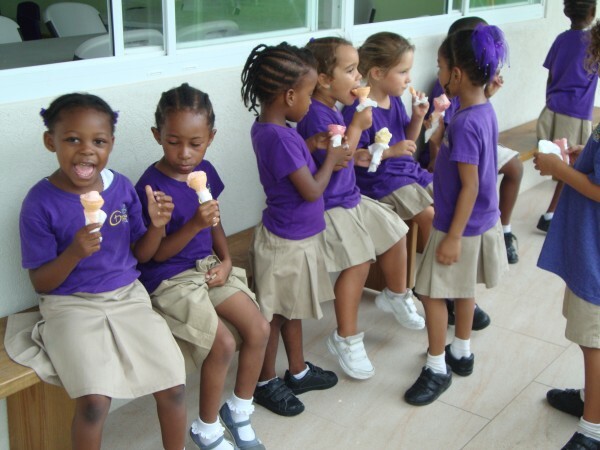 The NDC has done so much to improve education in Grenada and has been extremely supportive of our school opening. So we shall see what happens. January is always very busy month at Grace Lutheran because of visitors and this year was no exception. 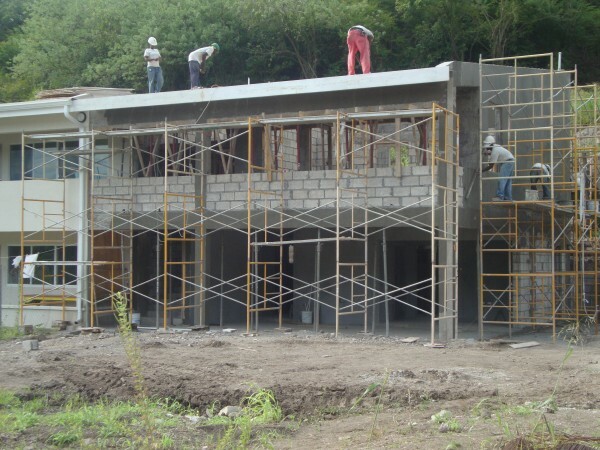 Wisconsin Lutheran College (WLC) sent a benevolent team to finish the rebuilding of Belinda’s home. This year they put on a new roof. They also did some painting of Andrea’s home in Cherry Hill as well as some projects for the school. They brought in a new projector for the school as well as half a library of children’s books. 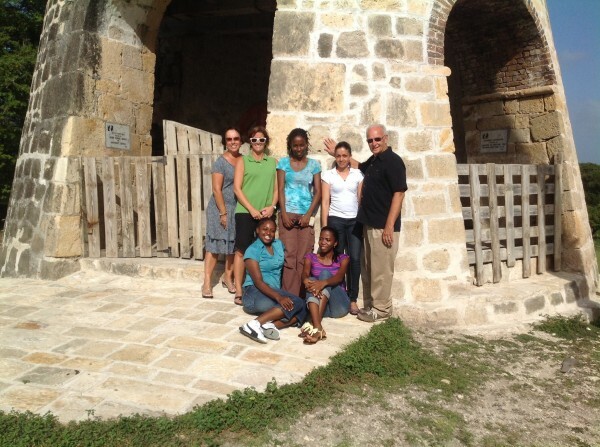 Several WLC staff also did several training workshops for our young teachers and other teachers on the island. Pastor Ron Muetzel and several investors got a chance to get a firsthand inspection of our blessings and progress. One of the areas they were interested in view is progress on the Phase 2 addition of the space we are hoping will one day be a café and a medical clinic. The building is almost completed but the plan to use it and man it is only just forming. An important meeting with leaders of the medical department from Saint Georges University (SGU) produced a commitment that they would provide nurses in training to staff our clinic should that dream come together. If these programs are to progress we will need funding and lay people to plan and manage them. We have some very promising prospects. If you are interested in investing in these exciting ministries please let us know. We need expertise, prayers, people, equipment, and resources. The café and the clinic are very different kinds of programs, but both need business savvy we don’t have. January has also brought us a bunch of new students for our school, five as of this writing. We anticipate at least one more. We are thrilled with these new additions as they show that word is getting out about the quality of our school and staff. The newcomers reflect the continuing diversity of our student body. Qing Qing’s parents work in the Chinese embassy. Natalie and Nathan are Guyanesse/Grenadian of East Indian ancestry. 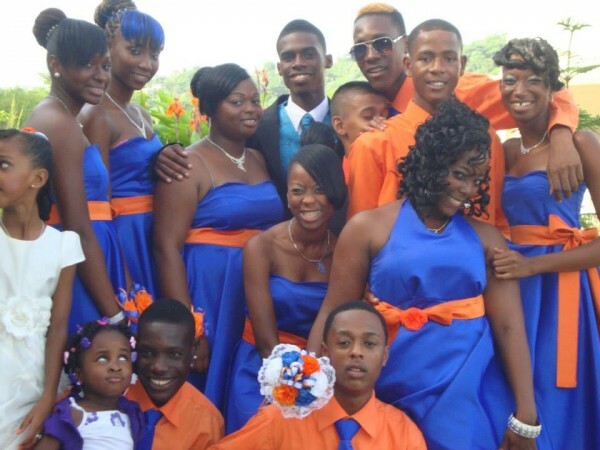 Kenson & Selena are Grenadian. Colbert is our newest staff Teacher’s Assistant in the First Grade classroom. It has been so nice to have a male presence on our teaching staff. One thing is always a given at Grace Lutheran and that is change. This month saw a significant rise in aftercare programs and participation. We added paid programs for Football (soccer), Art, Book Club, and Dance. These programs were extremely well received and have provided additional income. We are particularly thankful of Gabriella Kuzub-Beggs who is the new art teacher and is contemplating taking a portion of aftercare piano classes. As if all that wasn’t enough we are celebrating the baptisms of Vernard Celestine and Octavion Roberts. Sometimes people comment to me that we are experiencing so many blessings, are there any challenges at all? Well, yes, there are. We are having all kinds of issues running all the programs we are developing. We need to develop leaders and staff and often we take three steps forward and two steps back in this. The good news is that we are slowly seeing progress. music: "Come on Ring Those Bells"
Christianity is by its very nature profoundly relational. Every once in a while I come across someone who tries to tell me that their faith is personal. They don’t need church. This is a little like a fish saying he doesn’t need water. The Bible even describes God himself as relational calling him three persons yet one God. The passage above is one of many passages that describe Jesus relationship with the Father. Often God is interacting with himself; this is how He can be love even before he creates people. Because His people reflect him, and out of thanks seek to be like him, we are drawn to community. Our growing staff has been doing exactly that, “losing themselves” giving of themselves to exhaustion. As the school term winds down to Christmas break everyone is ready for a vacation. Between teachers, teacher apprentices, office staff, cleaners, cooks, after care teachers, and security guards our staff has now grown to just over 20 people. There are all kinds of growing pains as we seek to iron out a routine of procedures and expectations. We have been blessed with some very talented people and God is blessing us. To look back and see what God has allowed us to do in the past six months is amazing. As the term wound down we had a handful of students transferring in from others schools, including Ching Ching whose father works in the Chinese embassy, so word is getting out. We have had some changes in staff. Tamara Berry took over as our office manager and is quickly growing into her responsibilities just when we were struggling administratively. 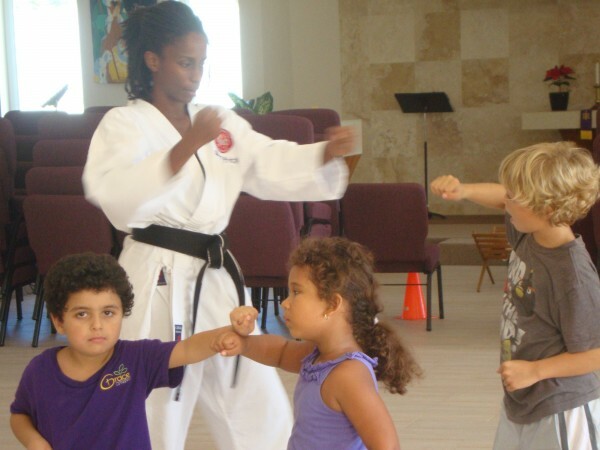 We continued to expand our after school programs with a Martial Arts class led by teacher Adonna Moore. She now expanded her times to include an adult class. 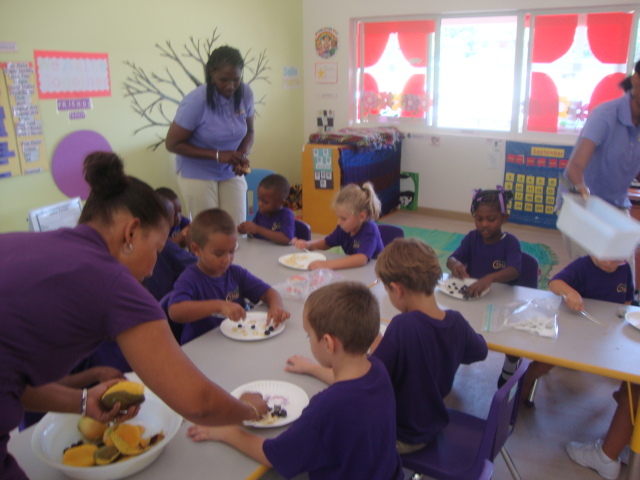 Maline Francis took over the aftercare classroom. Elvis Bristow was hired to teach soccer and physical education in the aftercare program. 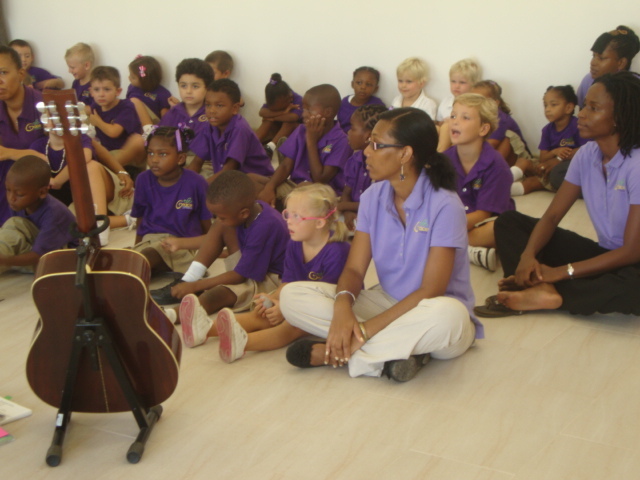 Our music program is settling also into our new facility. 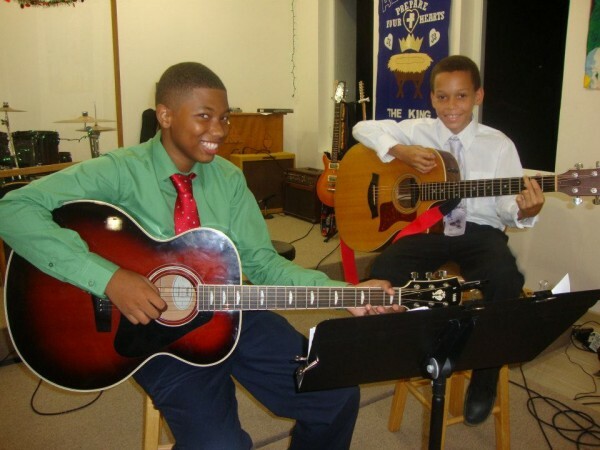 We had a joint Christmas recital with Deb Eastwood’s guitar students. We had a great turnout and many visitors from that night in worship the next Sunday. Vascey Alexander took over the school kitchen for Andris Belgrave while she is on maternity leave. 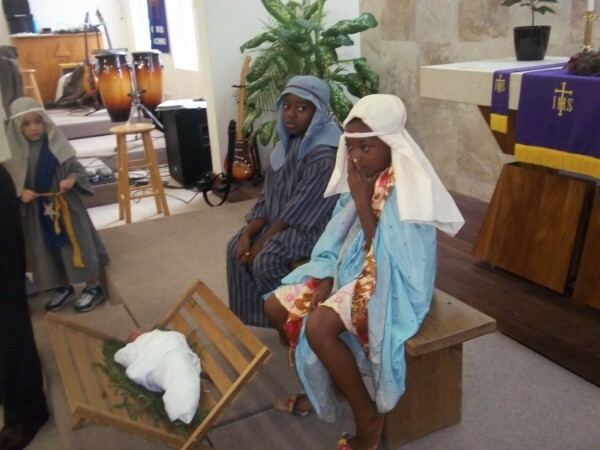 One the 9th the school children put on their Christmas program on Sunday morning during worship. We had a good turnout on a very rainy day. Tamara shared a very fitting poem and many parents expressed how much they enjoyed the service. A number of parents and members help with the costumes. Ellen Soukup produced the play and Adonna Moore directed it. 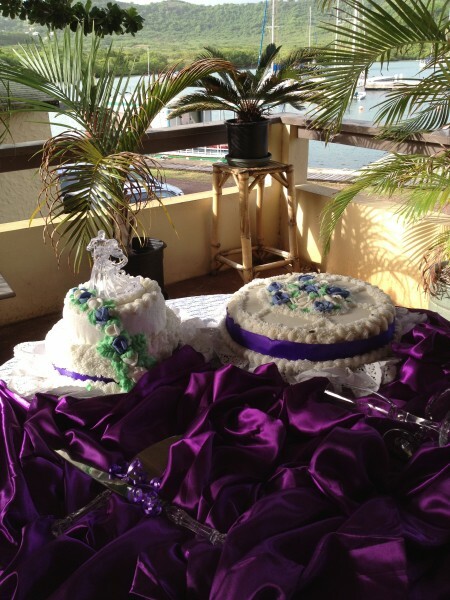 For more pictures of this event and others, check out our facebook page... http://www.facebook.com/#!/gracelutherangrenada . It is updated weekly with events and information. The Clinic/Café addition to our building is being built at an astonishing pace by Quinn Co.. They anticipate that the addition will be finished early next year. While we really appreciate their excellent work, it has been challenging for ministry and teaching to go on at the same time as construction. Plans are very much in the beginning stages for the use of this space. We are so thankful to those who have funded the construction of our amazing facility and those who make up our staff. The attention we are getting from the government and families shows that we are quickly establishing ourselves as one of the best programs on the island. During this season of generosity, if God has blessed you and you are looking for a unique way to say thank you, please consider a gift to our scholarship fund to help needy students come to our school. It not only helps the children, but it also blesses our program. Even more importantly, it honours our gracious Saviour Jesus. May each of you have peace and joy as you celebrate his birthday. In Robert Lewis Stevenson’s book “The Strange Case of Dr. Jekyll and Mr. Hyde” he tells a fascinating story about a brilliant man who feels that evil tendencies in him are holding him back from the good he could accomplish. So he invents a potion that separates his good side from his evil side. 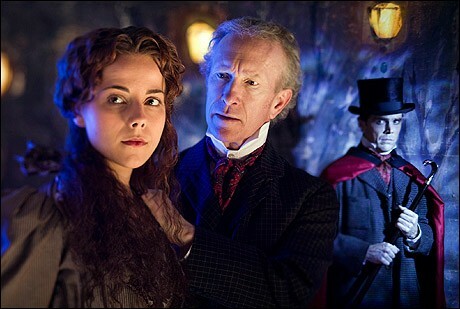 The problem is that the evil side, Edward Hyde, is so evil that what he says and does shocks and horrifies the good side, Dr. Jekyll. The essence of the evil is a complete and utter self-focus. Hyde will do and say anything to get what he wants and will not let anything or anyone stand in his way. Jekyll feels such shame for what he does as Hyde that he vows never again to take the potion. He sets out on a fanatical mission to redeem his shame with good deeds and his brilliant accomplishments are substantial. One day he is reflecting on all the good he has done when suddenly he begins to turn into Mr. Hyde without the potion. He is so full of pride, self-righteousness, superiority that he becomes Hyde, not in spite of his goodness, but because of it. Keeping all the rules and being self-righteous, he discovers, lead to the same evil as breaking all the rules! It is the beginning of the end for Stevenson’s character. This is exactly the lesson Paul is trying to teach the Galatians in the passage above. That it is possible to avoid Jesus as Saviour as much by keeping all the Biblical rules as by breaking them. It is the same lesson Jesus tried to teach the Pharisees and the same problem many “Christian” organizations struggle with in Grenada. There is so much time focused on what I need to do as a Christian, my confession, my choice, my walk with God, and shame because I have not lived as God would have me and I can do better, that God’s grace and my complete dependence on it is very hard to find. As one visitor once told me, “Yours is the only non-Arminian church in Grenada!” (Arminius is an old theologian who said that the reason people are saved is because they made a choice to follow Jesus in their life and if they are damned it is because they rejected him.) I doubt we are the only non-Arminian church in Grenada, but in my limited experience there are not many. 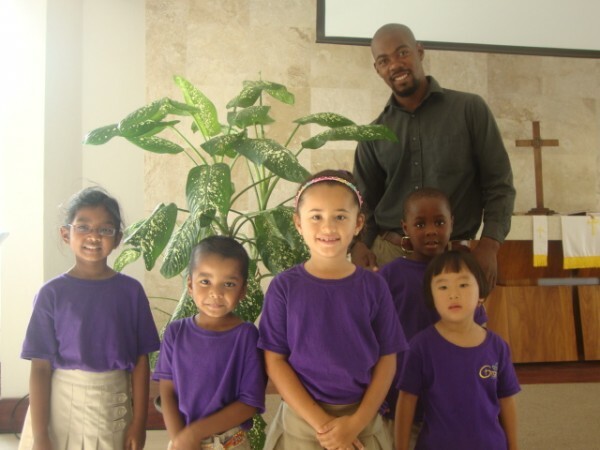 At the risk of my own self focused pride, I would have to say that this is the most important among many reasons why Grace Lutheran is different than many other churches in Grenada. Unfortunately most people think all Christian churches are the same or they just see external differences like your music is different or your service is more or less reverent or “Spirit filled” than ours or the people are really friendly. Sometimes they notice that your church lets people dance or drink or go to movies. Perhaps the lesson is that there is, as Jekyll learned, no perfect human, or in our case, no perfect church. We all desperately need God’s grace and that is why we come. Jesus gives me the holiness and righteousness that I cannot achieve in this life myself. This may seem like a very strange way to start a blog that will report so many amazing blessings that God has given us at Grace Lutheran in Grenada. But as impressive as all these blessings are… they are nothing compared to what Jesus has already given us: undeserved love, forgiveness and acceptance into His eternal family. All the rest is frosting on the rum cake. Still, I like frosting, so let me tell you what else God has done for us at Grace. 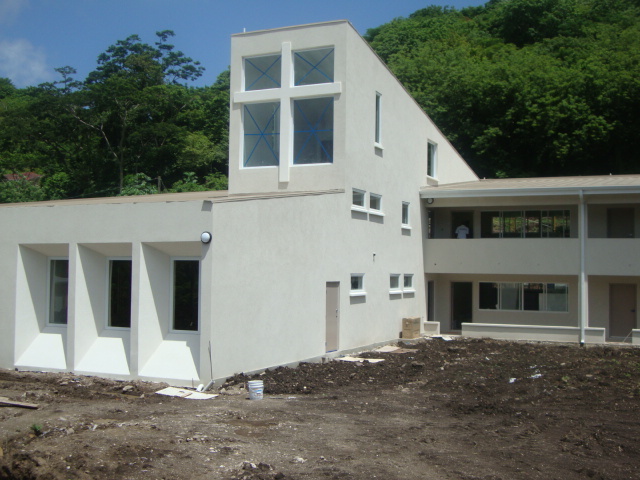 This month marked the historic completion of our first permanent church and school building. On September 23rd we dedicated every aspect of the building to the glory of God and asked for His blessing and protection. There were three aspects to our celebration. The first was the morning dedication worship service. We began in procession at the front entrance of the property and proceeded to bless the school door, offices, classrooms, and kitchen. Then we went to the Purple Heart church door to bless entry, instruments, altar, font, and lectern. President Guse of the South Atlantic District honoured us with a message from God’s Word about the blessings we find in God’s house. Our readers were Shemron Ross and Marinus Coutain. 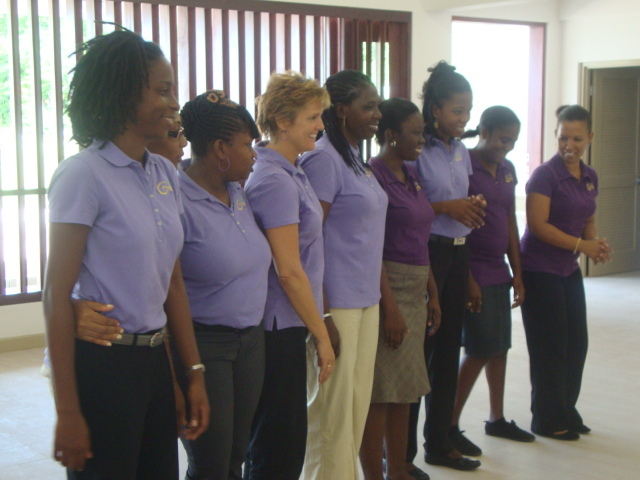 Another highlight was our colourful gospel choir. After worship we enjoyed a time of fellowship and open house as our people proudly showed off their areas of service to guests. The ladies in the kitchen under the leadership of Alice Braithwaite and Chef Desmond Lewis in particular shined. 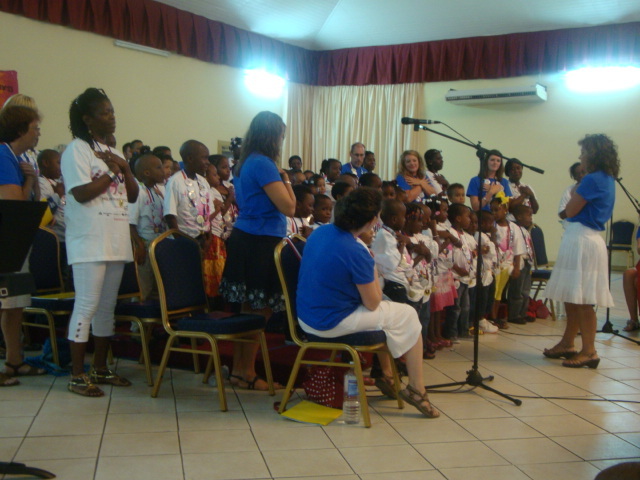 The afternoon program featured children from both our Sunday School and parochial School with skits and song. Our government’s Permanent Secretary of Education was a guest of honour and shared wisdom and well wishes in her speech. Also speaking were Dei Sylvester, Pastor David Kehl, and other special guests included Pastor Jason Richards of Antigua, and Staff Minister Erik Landwere of St. Lucia. Another highlight of the afternoon program was the youth skit specially written for the occasion entitled, “The Lion’s Hair”. Altogether our celebration lasted a good six hours and near 300 people came and went in the course of the day for the various programs. Of special note were the many neighborhood visitors that we had gone out of our way to invite. Also there were over a dozen guests from the US to help us celebrate many of them longtime supporters of our ministry. It was a joy to thank God for their support. Thanks also to our members for inviting their friends and being such delightful hosts. That was just one very big day. To be honest, there are so many other blessings we are struggling in keeping up with them all. I never dreamed it would be such a challenge working with a large ministry staff. We now have 20 people on our staff and it continues to grow. Our latest additions are Tuck Shop cook Andris Belgrave and aftercare swim instructor Deb Eastwood. We are starting small with a hot lunch program but we hope to expand in the future into a full blown café if God allows us. We continue to add to our aftercare program and many students who are not in our school are starting to take advantage of this program. For some time now our music program has thrived, but now one of our teachers, Adanna Moore, teaches martial arts and we have an arrangement with the Chinese embassy up the road to use their pool for swim instruction. This has led to some intriguing connections with the Chinese community. We have had Chinese visitors coming to church and Sunday School and others inquiring about our school. We believe these connections as do all of our aftercare programs have a lot of potential for growth of our ministry. The aftercare programs have also been a great way to incorporate volunteers in our ministry both inside and outside of our church. There were other changes in staff this month. 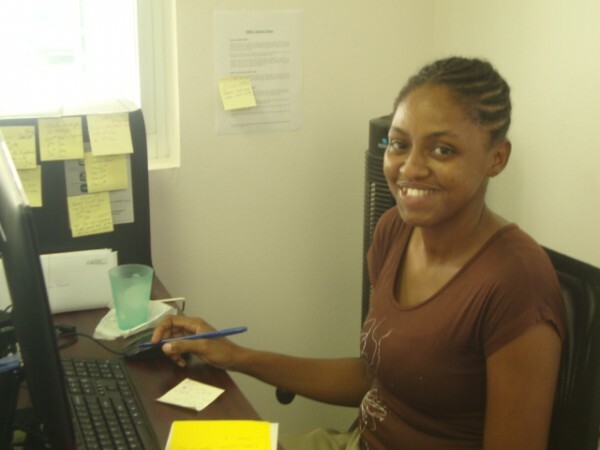 Our office manager, Tamika Gilbert received a full scholarship to pursue a master’s degree in business and went back to school at SGU. It will be a challenge to replace her. So much ministry is going through our office right now that it is impossible to keep on top of everything. As we adapt to all the changes that are going on in the lives of our staff, please pray for us. Already we can see big improvements in the lives of our school children and we thank God for using us. By the way, talking about blessings, last month we made a special appeal for a gift to cover Jean’s tuition. We have received gifts for half her tuition, your generosity continues to allow us to do great things for our Father. If you are moved to cover the rest of Jean’s tuition we would love to introduce you. 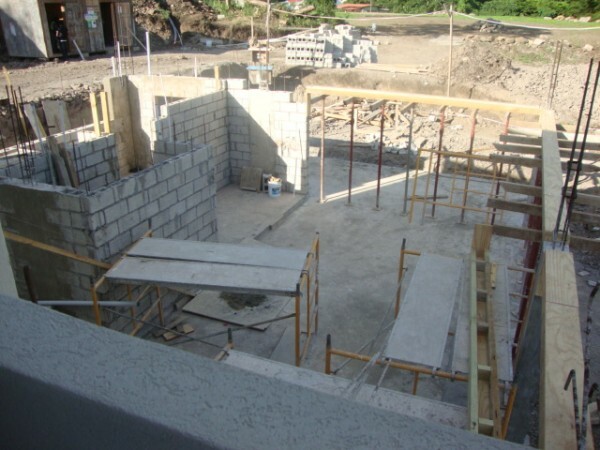 Our construction company, Quinn, continues to do impressive work on our site and on our building which makes running a school at times very challenging, but we are thankful for what they are doing. We are still working out bugs in our sound and video equipment, especially for worship. We are working out bugs with things like keys and soap dispensers and little issues every new building has. In general we are so blessed and have noticed an increase in both visitors and old members coming back to our services. We have a good group of anywhere from half a dozen to a dozen who are almost finished with Bible Basics class and want to become members. For the first time we have enough men to fill reader positions, ushers, and still man our worship band. 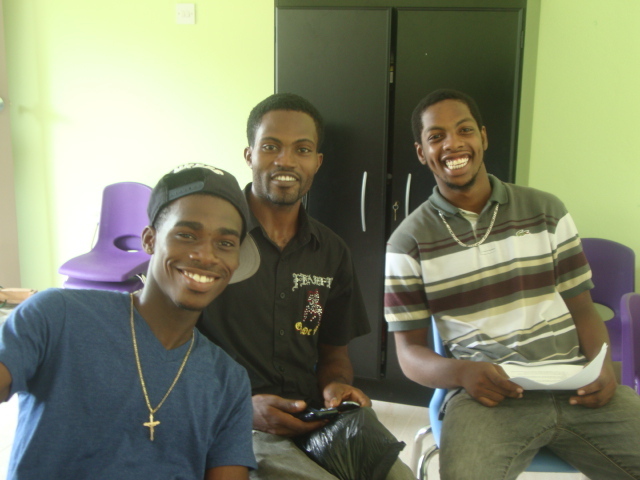 We are thankful to Dei, Andre Worme, and Kelvin LaTouche for forming a solid group of mature ushers. 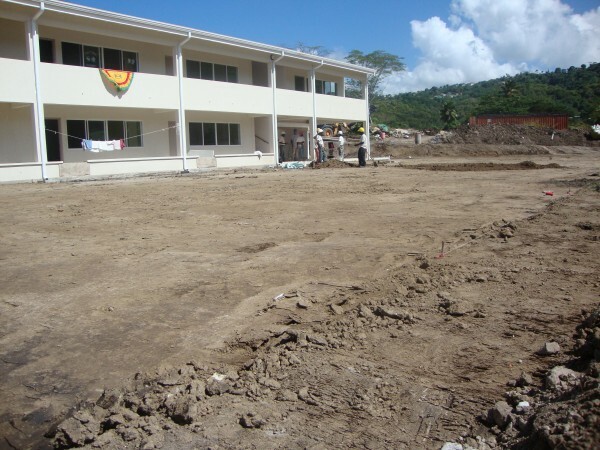 As you can see work has begun on Phase 2 of our building program, the Café, playground, and perhaps a medical clinic. While we have much of the funding for this project we are still looking for both funding and planning for the phase 2 programs and facility. If you are interested in and have experience or training in helping us with planning and implementing a café or a medical clinic ministry consider the possibility that God may want you to serve here. If you know someone we should ask, please contact us. Nurse Pat Schlosser, who was here for dedication, was able to get an important meeting with the Grenada Governments Chief Medical officer and visited a number of island clinics to evaluate what direction we might best go in our planning. 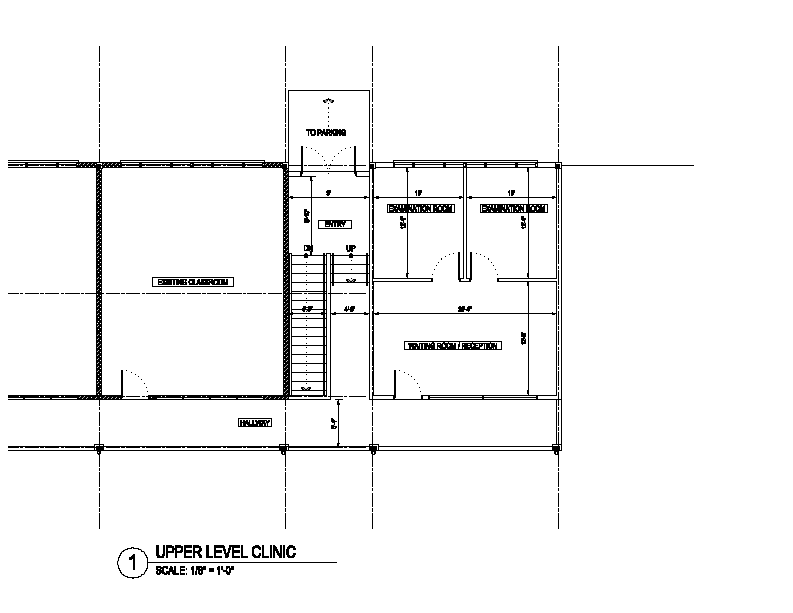 The Chief Medical officer was very positive about the possibilities for our clinic and promised assistance with counsel, permits, shipping concessions, and staff recommendations. In closing let me tell you a story about Gordon. 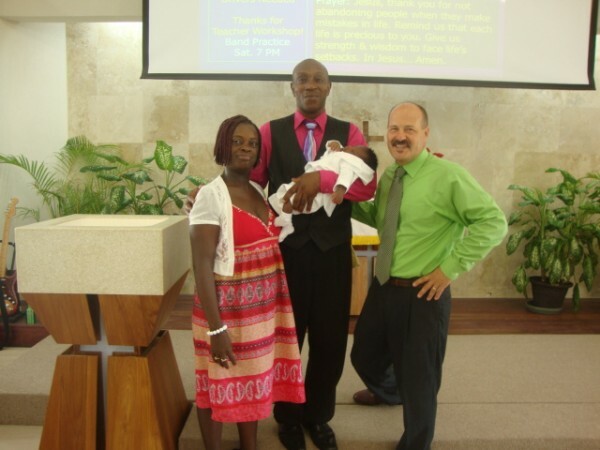 Gordon is not real, but his story is not uncommon in Grenadian churches. Gordon is a young man with a colourful past. He got in with the wrong crowd and the wrong girls and he made several bad choices. Years later Gordon meets a new girl who has a strong dedication to a local holiness church. He decides that he is going to turn his life around, make some real changes. He goes to church faithfully with this new girl, starts a family, and starts making Godly choices in his life. He even begins to get very involved with the church’s ministry becoming a deacon and working with the youth. His faith grows and his work is blessed. However, in Grenada everyone knows everyone and it is only a matter of time until his past catches up to him. In response to news of Gordon’s past the pastor preaches a scathing sermon against the very sins Gordon committed. Gordon is ostracized and forced to sit in the back row of church during worship. 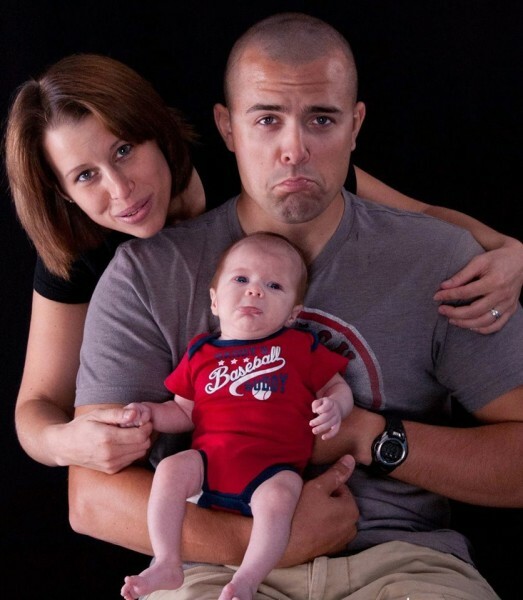 He is removed from his deacon status and his family is humiliated. Members treat him differently and talk behind his back. In time Gordon quits going and begins a search for another church where he can continue to grow in faith and serve God in a context of love and grace rather than slander and shame. This is what happens too often in an Arminian church that puts complete emphasis on what I do or don’t do for God, rather than what God does for me. A number of Gordon’s have already found us. Pray that God lead more to us. I know you just got one of these two weeks ago, but there is so much happening here that I just had to share. Secondly, I have a special opportunity for you today. If you have been following us at all you know that today we opened our new school! Wow, what a day! We started with no electricity. We are trying to go from temporary construction power to Grenlec power and the transition has been challenging. And our construction company still has a few finish items left. On top of that it was very hot and muggy; September is our worst for heat (no we don’t have air conditioning in our classrooms). Our electricity is some of the most expensive in the world and cost prohibitive. But none of this could stop 32 laughing, excited, purple uniformed students from enjoying an unforgettable first day of school. Thank you Lord, we actually did it! I can’t tell you how much work went into starting this school. We are especially pleased with our staff which continues to grow. In the last two weeks we have added three security guards, Patrich Roach, Daryel Slocumbe, and Ron Charles. We also hired Alice Braithwaite and Belinda Griffith as cleaners, and Jonella Jerome to help with our aftercare program. Our staff is now full and it was no easy task interviewing and hiring all these people. Thanks to Dei Sylvester, our Business Manager for the outstanding work he has been doing through this transition period into our new facility. Dei also is overseeing the school books with Zingy Berrotte our bookkeeper. This brings me to the special opportunity I mentioned earlier. But first I have a story. 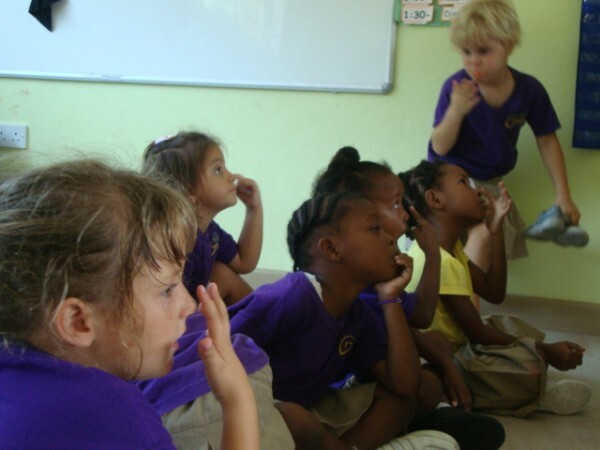 My wife, Ellen, our preschool teacher, signs and enjoys working with the deaf community in Grenada. 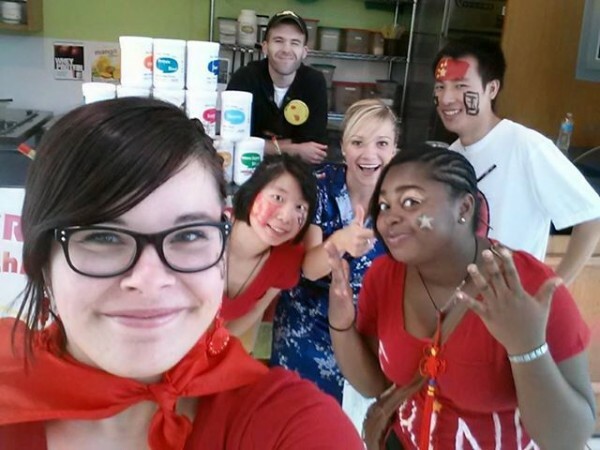 In that process Ellen met a young deaf couple Johanna and Cassandra and their daughter Jean. Both parents are deaf but the daughter is hearing. Since the parents don’t hear or speak little Jean is behind with her English skills. Ellen had hoped to talk the parents into letting Jean come to our school, but before she could ask, mom got ill and they lost contact. 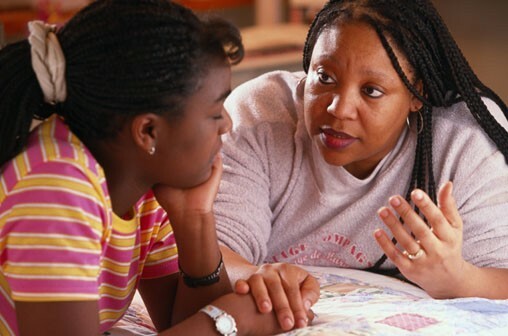 Then a week before school opening a government education inspector was so impressed with our program, staff, and facility that she asked is we would consider take referral of students who they felt were falling through the cracks in the system. We were honoured. A day later they called referring… Jean to our school! Our commission wrestled with the issue and we agreed to give Jean a scholarship in hopes that we could raise the money for her tuition. 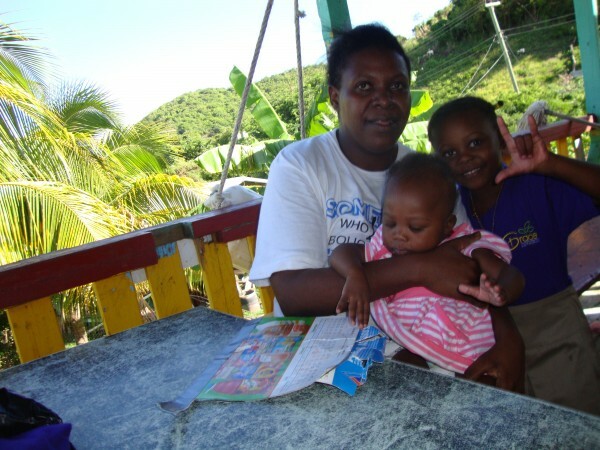 If you can help Jean’s family, they will need $1,500 US a year grant to keep her in school. Most Grenadian schools are not equipped to handle Jean’s needs and this is a wonderful opportunity for us to minister to this needy family and build good will with our government. A number of you already sponsor children in our school and we are looking for a full or partial sponsor for Jean. If you can please help, contact us at Gracelutherangrenada@gmail.com. September 8th then marked our first worship service in our new facility. Busloads of our people arrived, many of whom had not seen our facility in months. Over a hundred people came to worship and there were all kinds of tears and wonder at God’s blessings. The day reminded of the birth of our sons, so much anxiety, excitement, wonder, and joy. It’s a good thing we began using the facility before dedication because there were a lot of bugs to work out and many finish items were still not finished. It is doubtful everything will be done by dedication, but this facility is so much better than our old place that it is a little taste of what it must be like to walk into heaven for the first time after struggling for a lifetime on earth. It is also already very clear that the new facility is going to add a huge boost to almost every one of our programs, Bible study, Sunday School, ladies group, Grenada girls group, youth, and music. As if all that wasn’t enough, we have begun work on Phase 2 of our plan which at this point will be a Café and a clinic. Below are some of the blueprints. The Café will be used by staff and school in the mornings and as a local café in the evenings. It’s main feature will be a covered playground that will be used by both school and Café patrons. 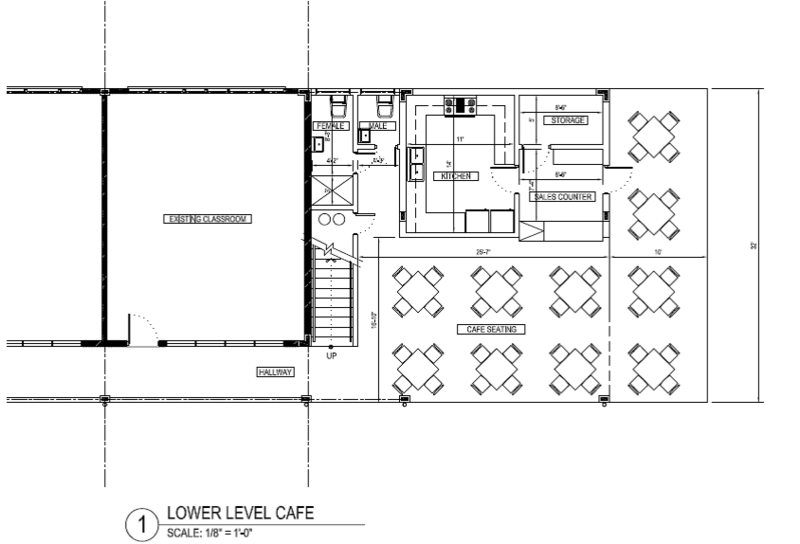 The Café will serve inexpensive local foods in hopes of attracting young families to our campus. 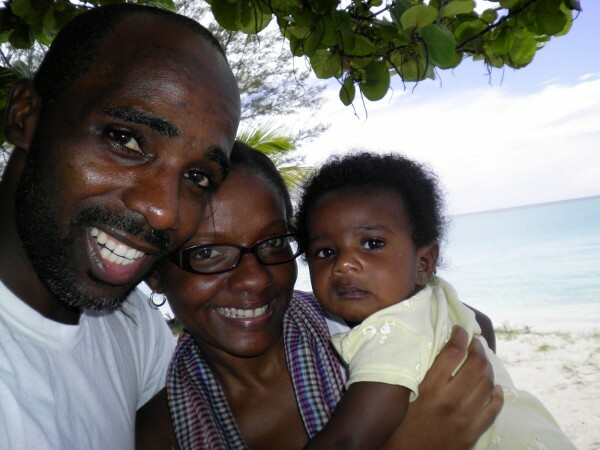 There are many fine restaurants in Grenada, but very, very few that cater to young families. We think we will find a nice nitch that will serve to generate income for our ministry and jobs for our people as well as make connections with our neighbors. The clinic will be much more challenging to develop. We will need experts in the medical field working with Grenadians to best determine how to implement this program. We already have a number of volunteers and donors in the medical field who are interested in developing this ministry. 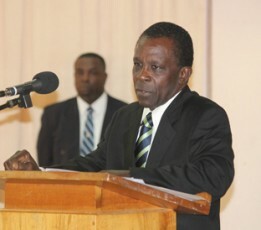 There is no question that the medical sector is a great need in Grenada. We are confident that God will continue to lead us in the direction he wants this to go. At the very least it will become a home for visiting medical groups and the training of Grenadians in this field. Although we have already raised a good portion of what we will need for phase 2, we are still looking for gifts to fund the Café, playground, and clinic. Thanks to those who continue support us in these future ministries. We know there are many places you could put your gifts to work and we vow to be good stewards with your investment in God’s work. Thanks for taking the time to follow and support us. It means a lot. This month is Carnival in Grenada. It is the first time we have actually been on the island during this time of the year. 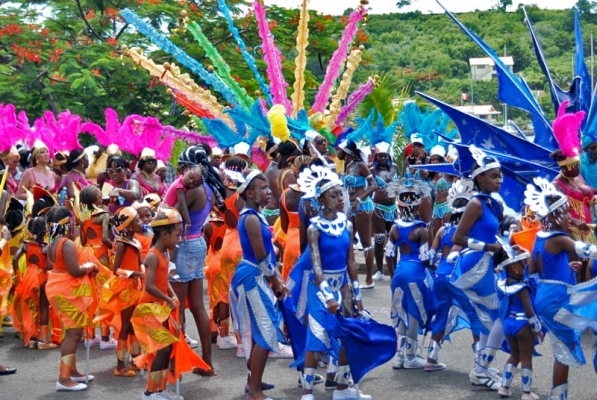 Carnival is one of the biggest cultural events in Grenada and includes week long celebration of art (costumes), music (calypso, soca, and steel pan), dance, and social celebration. Unfortunately, like Mardi Gras in the US and other countries, drunkenness and open displays of immorality have become such a part of the festivities that it has soured a good many Grenadians on their own festival. Each year at this time there is a tension between Grenadian Christians and Grenadian cultural advocates. Occasionally I will get complaints that Christianity with its claim to one truth is in conflict with cultural diversity and open minded thinking. Some even try to tell me silly things like Christianity is a European or a white man’s religion and has no place with people of African culture. They say this in spite of the fact that Grenadians are over 90% of African descent and over 90% of them claim to be Christian. Contrast this with stats that show less than 70% of Europeans are Christian. Interesting that in the above passage John sees a vision of perfected believers in heaven and they are clearly of every “nation, tribe, people, and language.” That sure sounds like heavenly cultural diversity to me. I might also mention that Christianity did not start as a faith of any particular nation. From Adam on followers of the true God were found in many nations, including Ethiopia and Egypt, both African nations. Jesus was a Middle Eastern Jew with Arabic skin colour and culture. The flag of Christianity has marched from nation to nation down through history, Greece, Italy, Spain, Germany, England, Grenada, United States, and now God seems to be working with a mighty hand in China and Asia. In each place Christianity has retained the truths of scripture and adapted to the culture of the people. I can’t think of a single other religion that can make such a claim. You don’t have to look at our world long to realize that the God who made it loves variety. As Christians, it is important that we remember this, stand for the truth, and discern right and wrong while embracing culture whenever God allows. Another event happen this month that will have an impact on our culture for some time is the victory in the 2012 London Olympics of Kirani James. 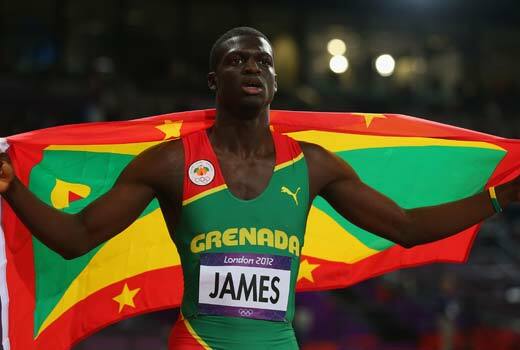 He is the first Grenadian to win an Olympic medal in history and he has fired the imagination of young people across Grenada and stirred great national pride. Thankfully Kirani not only appears to be a Champion athlete but a class person. I especially enjoyed his public exchange with the young man with no legs who ran with him in his qualifying heat. 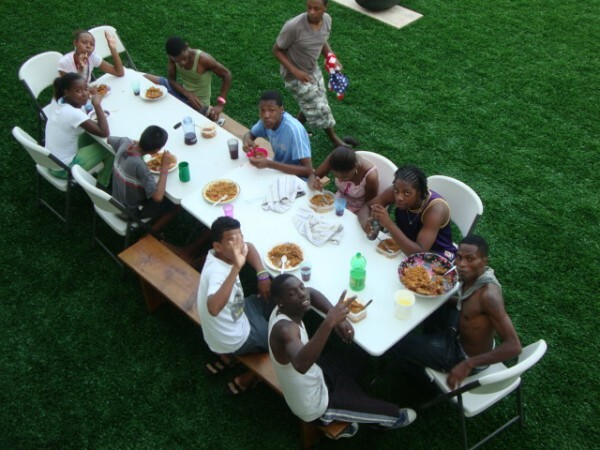 Grenada needs successful, classy and humble young male role models. Well done, Kirani! All right let’s get to what is happening in Grace Lutheran ministry, because there is a lot to tell you. Each month lately is busier and more blessed than the last. What were we thinking finishing a building project and starting a new school at the same time? God has given us great people to work with though so we are doing it and well so far. I worry about keeping up this pace though. Kirani would probably tell us to save energy for the home stretch. One of the highlights was the ministry of the Wisconsin Lutheran College (WLC) education team. 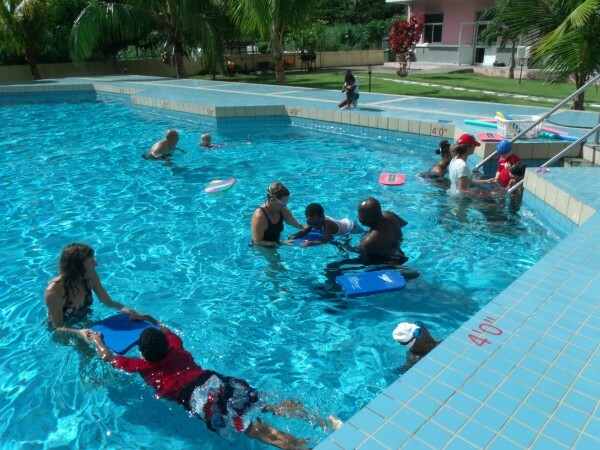 They put on a national workshop for Grenadian teachers across the island. This years over 300 national teachers were in attendance. The WLC team was amazing but much credit has to go to our staff for setting up the workshops and advertising them. The following the workshop a WLC team led by Dr. Sharon Burrows and WELS teaching volunteers put on a two week science camp and closing program. This was a great boon to our program, both in materials they brought and the training for our people. Perhaps the most significant point is the connections we renewed with our US brothers and sisters. Thanks guys, you made great memories and God really blessed you once again. Finally, the long awaited and much hassled over shipments arrived at the site. Back orders, miscommunication, pallets falling on pastors, debates over tariffs, and just about everything that could have gone wrong went wrong. Still we were relieved to have the furniture and equipment and thankful to those at Divine Savior, Doral, Florida for their help. We also need to give thanks for George on the docks who waved his own fees because we are a Christian church. Thanks brother! Preparation continued in earnest for the quickly approaching school year. Jenelle Bullen and her staff have been frantically working to get accounts in order, staff hiring complete, teacher training schedules in process, classroom materials and furniture moved and sorted out, government approval handled, parents informed, and all the stuff required to open a school. We are not just opening a school, we are striving to do it better than most and I believe we are succeeding, but time will tell. We are up to 30 students but are expecting a few more at the last minute. Our teaching staff now includes… Ellen Soukup and Camme McIntosh (4yr preschool), Samantha Perkins (just married), Jacqueline Coutain, and Maline Francis (Kindergarten), Adanna Moore, Felisha McPhoy, Francine Walters (1,2 grade). All these ladies have different and assorted roles, but we are so thankful for our team. We think, with God’s help, they will make our school very special. We are also now in the process of interviewing and hiring cleaners and security guards. Dei Sylvester is in charge of this area of our work. Again efforts are being made to get the right people on our team. As you can see from pictures our new facility is nearing completion. I don’t have the space to describe for you all the work that has gone into this project and how excited we are to begin using it soon. Quinn construction and architect Trevor Bullen have just done amazing work. Enough thanks cannot be expressed. There are a few finish items still to be completed, but the classrooms and bathrooms are now ready to go. The rest will be useable by the end of August. Volunteers have been painting, moving and assembling furniture, and setting up classrooms. Special thanks go to Jack and Erin VanDeGuchte for their much needed help in these things. Thanks also to the New London congregation for again supporting our work and sharing your called worker with us for a couple weeks. Both Jack and Erin were very helpful with our teacher training as well. We miss you guys, come back soon. 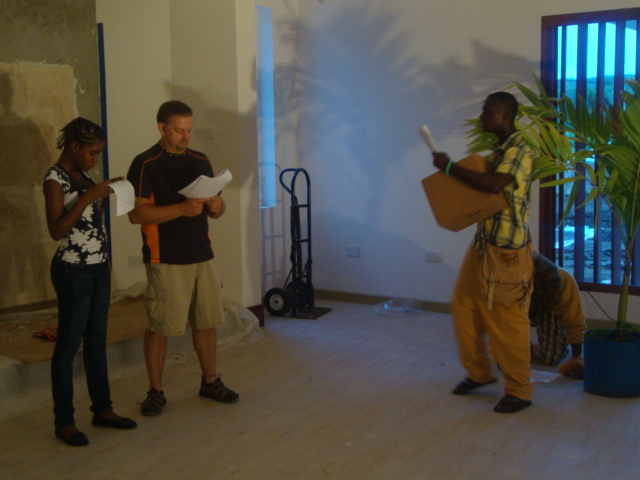 The picture below is Jack working with our youth group preparing their dedication skit. Which brings me to my next subject, our dedication celebration. We have set September 23rd as the Sunday we will dedicate and celebrate our new facility. Visitors will be coming from all over. There will be an open house and special worship service and afternoon program with skits, music, and much good fellowship. We have to sing God’s praises for allowing us to be so blessed. 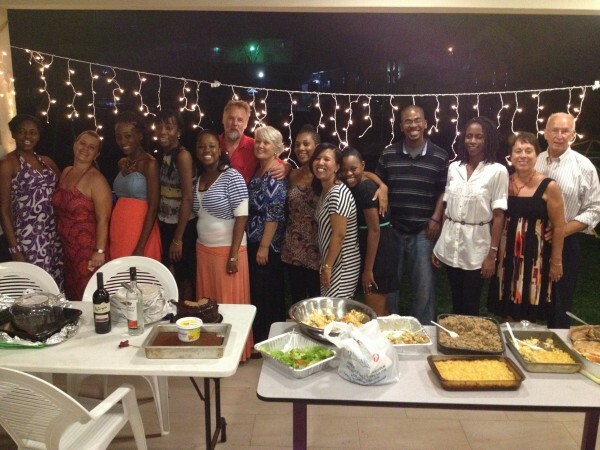 Our ministry very much reflects Grenadian style from our staff to our facility. We are unique and yet we stand firmly on the truth of God’s Word. God, you are amazing! 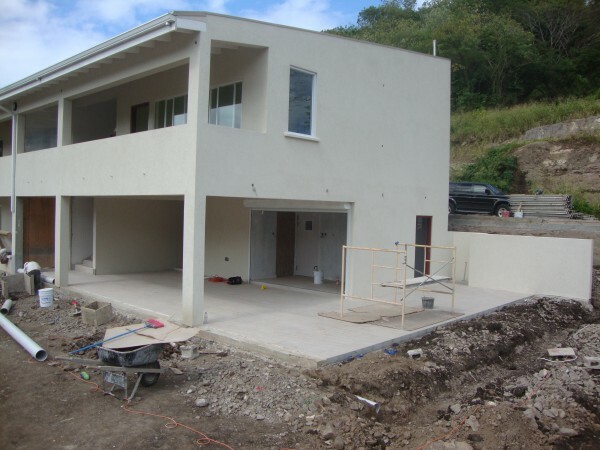 I try also to lend a personal note each month and as if everything at church and school and on the island wasn’t enough, the Grenadian Soukups chose this time to move into a new house. Yes, we are crazy. The new house will allow us to be better hosts to our guests and to be more social with our people. We also regret that we missed a very special family gathering in Northern Wisconsin as Jordan and Aubrey Soukup were united in marriage. God richly bless you guys! Until next month, pray for patience, peace, and energy for us. BYE!